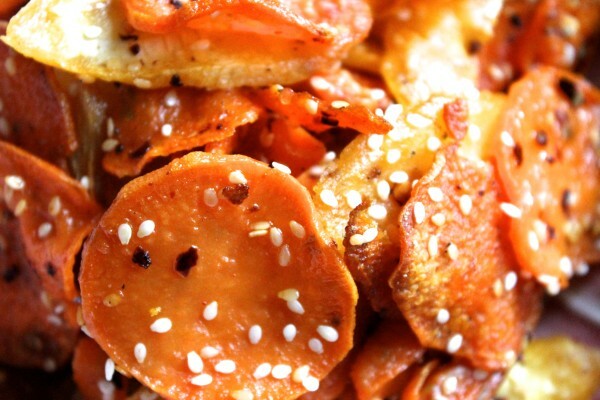 These oven baked sesame seed sweet potato & parsnip crisps are such a delicious healthy comfort food. It’s the perfect healthy tasty snack to nibble on when it’s turning chilly outside. I used a potato slicer to cut my sweet potato & parsnip into medium sized crisps then gently massaged the olive oil thoroughly to ensure every crisp is fully covered in olive oil. Sprinkle the sesame seeds, chilli flakes evenly over the crisps. Place in the oven at 150 degrees for 45 minutes on the bottom shelve until crisp. Sweet Potatoes are a nutritious food packed with antioxidants like beta carotene, vitamins C, E & D, and minerals such as manganese and iron. They are also high in potassium, which helps to lower blood pressure by removing excess sodium and regulating fluid balance in the body. Sweet potatoes are an excellent anti-stress food and are known to help steady nerves, relax muscles, and balance cognitive function. They are also one of the best anti-cancer foods and can particularly help to prevent breast, colon, lung, skin, and oral cancers. Sweet potatoes are known for being easy to digest and are very good for ulcers, inflamed colons, digestive disorders, and constipation. Sweet potatoes contain compounds called phytochelatins that can bind to heavy metals such as lead, copper, mercury, & cadmium and safely remove them through the body. The health benefits of sweet potatoes are the most bioavailable when eaten steamed, or baked. They are a comforting, satisfying, and very healing food so consider finding more ways to include them into your diet. Parsnips belong to the same plant family as celery, parsley and carrots. Parsnips contain a wide variety of vitamins, minerals and nutrients, including dietary fiber, folate, potassium and vitamin C.
Sesame seeds are an important sources of phyto-nutrients such as omega-6 fatty acids, flavonoid phenolic anti-oxidants, vitamins, and dietary fiber with potential anti-cancer as well as health promoting properties. The health benefits of crushed red pepper extend beyond its use as a flavouring. These spicy little flakes can also boost metabolism, decrease hunger, decrease pain and possibly fight prostate cancer. Olive oil is oil that is pressed from olives, the fruits of the olive tree & is considered one of the healthiest fats to eat. This dish is a wonderful & healthy snack for all to enjoy. Tasty coconut & ginger, vegetable curry.